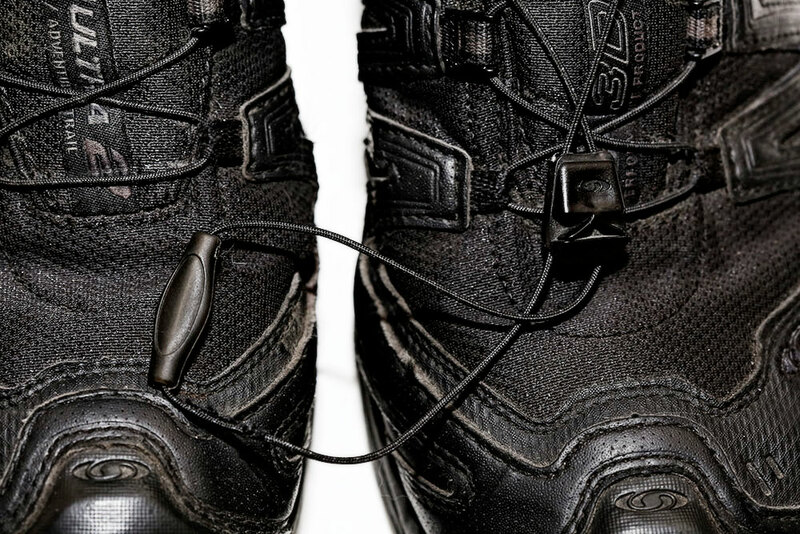 Per the manufacturers website, the XA Pro Mid GTX are Mid height and fully waterproof, this iconic shoe for moving fast on rough terrain gets an improved collar design for more comfort, and updated outsole for superior grip on any surface. There are several different versions of this shoe, I purchased the standard Black/Black/Asphalt version which is the one I will be reviewing here. I purchased it from Amazon in 9/12 for around $160 and wore them on duty since that time until around 11/15 when I purchased its big brother, the 4D Quest Forces in black.
. As you can see by the photo below (and others), to fix the issue of having an all black shoe, I took a permanent marker to all the white/non-black areas, more on that below. The XA Pro Mid GTX shoes came in a very similar box as the SpeedCross 3's and wore very similar. 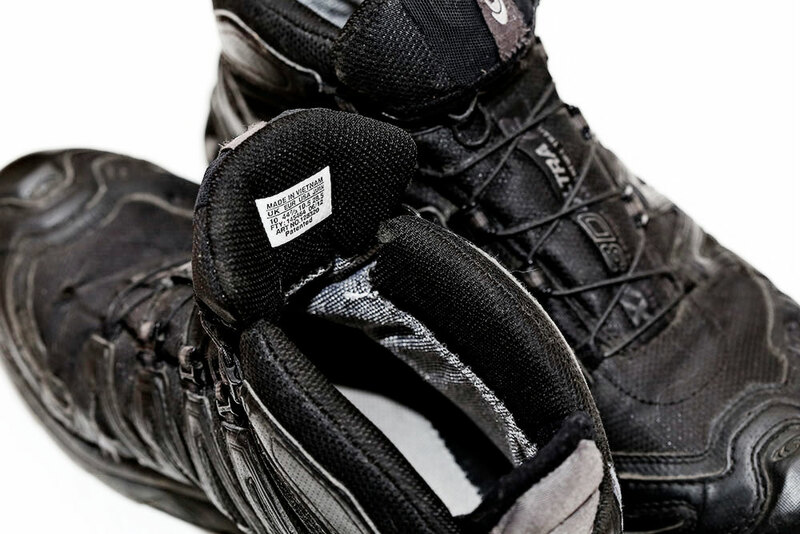 I began to wear them and realized they were more shoe than sneaker, while providing the active support and ability to conduct active movement. The soles were the same Ortholite branded type as in the SpeedCross 3's and that made the transition very easy. 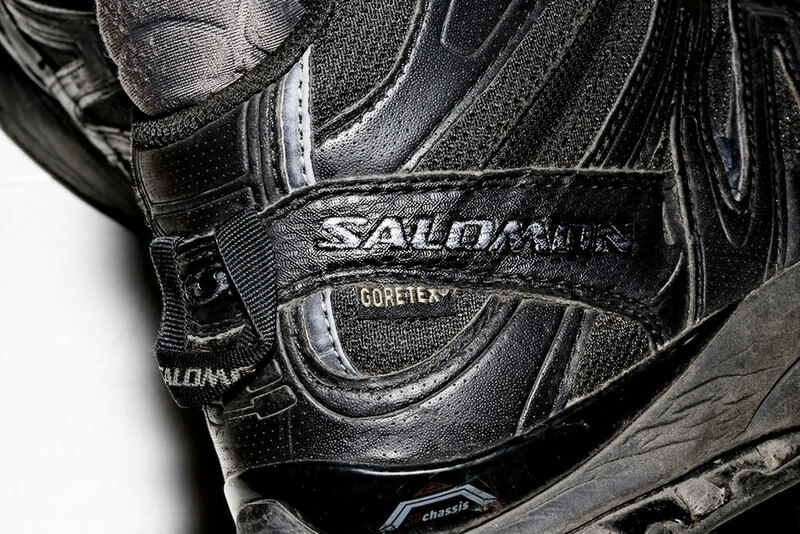 To me they seemed firm at first but after a short time they did not feel any different than my other Salomon shoes, slowly loosening up but not in sacrifice of comfort or performance. 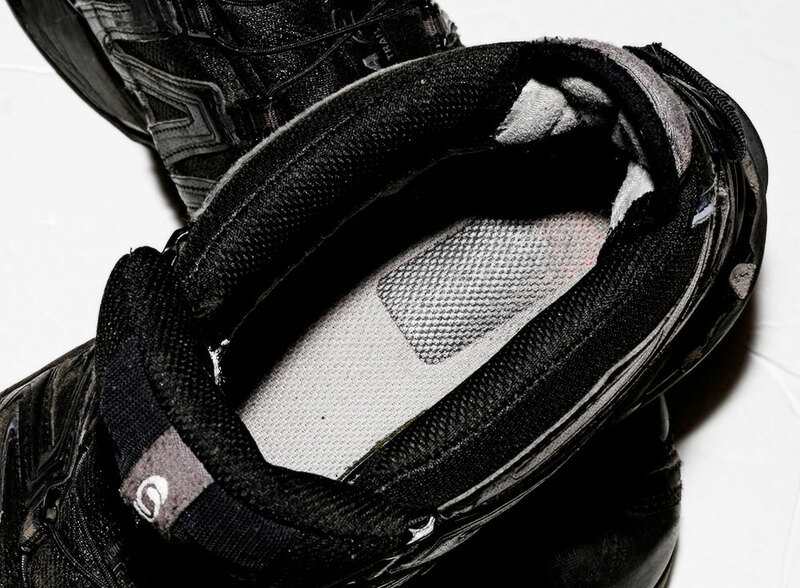 The pull tab/cuff on these shoes double as a pad against rubbing/bruising for your Achilles, which is a well thought out part. The toes are rubberized and waterproof. While the whole shoe is not waterproof it is water resistant and dries pretty well if water manages to get inside. 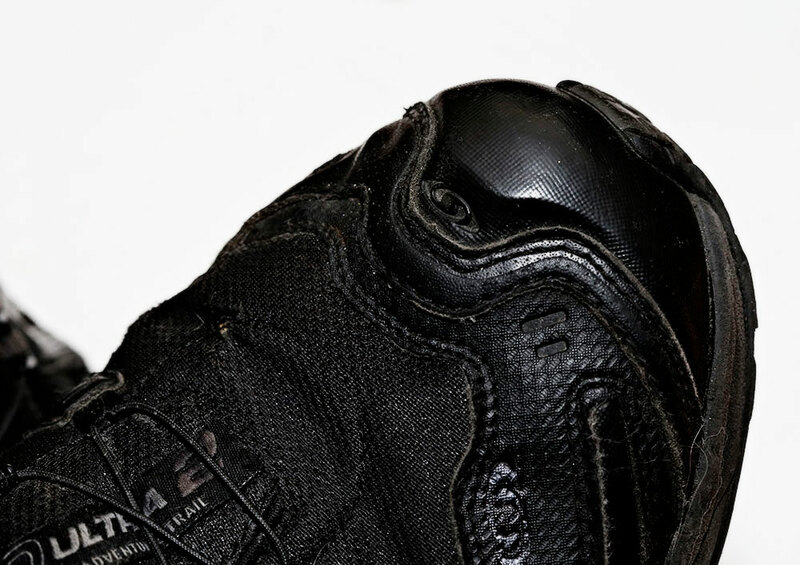 , which is one of my favorite aspects of Salomon shoes. I have never had any issues with this feature and I highly doubt I will ever. version. On the hot side, when it got to around the 80-90 degree mark I started wearing Under Armor HeatGear No Show socks, which are pretty good at not letting your toes/heels get sticky hot. The above images shows the biggest issue I had develop, the back heel began to rub raw under the rubber material and it would make a "squish" sound when I walked. That was probably a few months past its extended use date and required replacement. Aside from the heel rubber worn off at the edges, above shows the difference in the two, the right has more wear on the heel because it the foot I use to hit the gas/brake pedals. 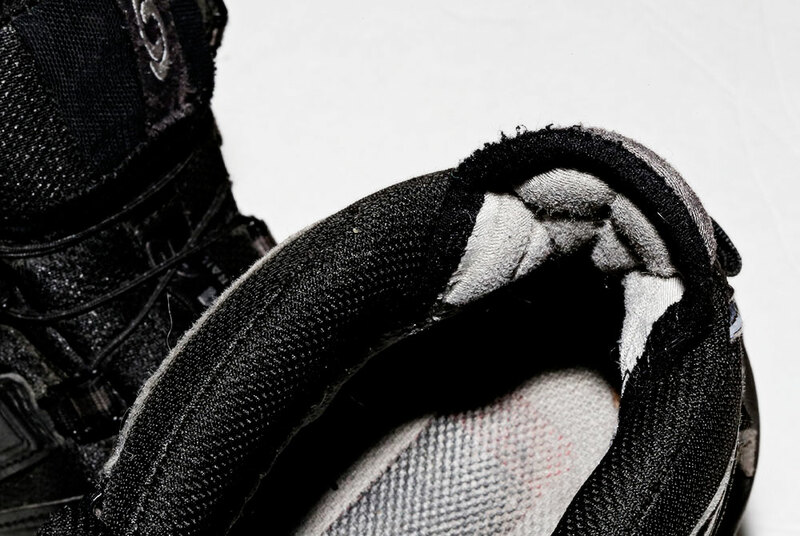 If you look at the left shoe towards the front inner side you will see a big chunk missing. That is from stepping on a pretty gnarly exposed nail and it ripping a chunk of my shoe off when I walked by. 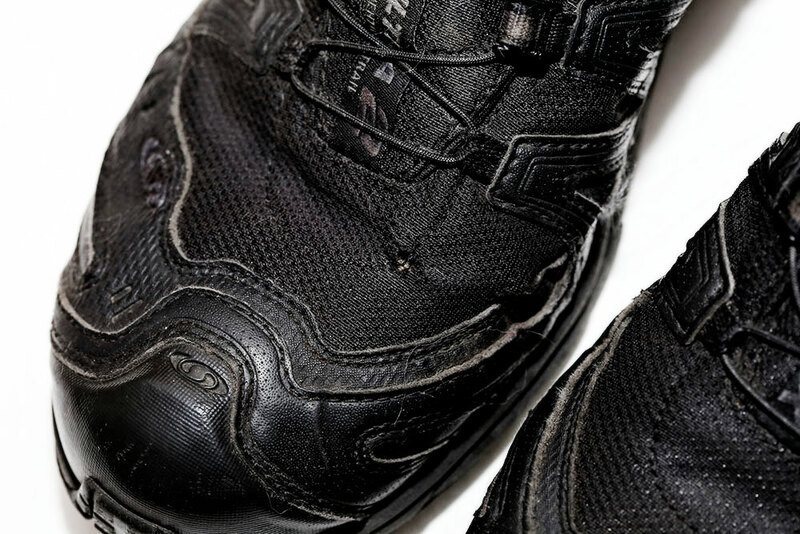 That was about three months before I decommissioned the shoe from duty work. The above image shoes a nice little hole from when I ran into a burning building. Aside from being covered in ash, one of the shoe tops took a piece of timber or something that burned a small hole in it. 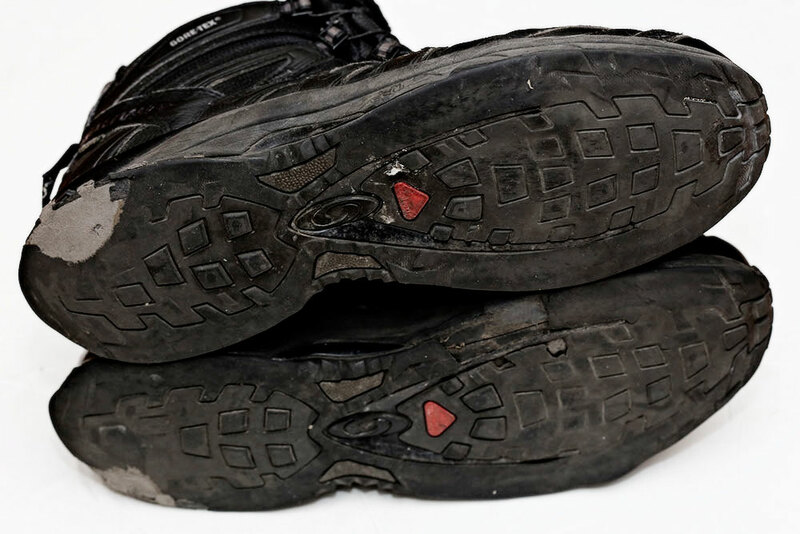 That was about a year or so into its use, I did get the occasional rain drop that would find its way in there, but nothing that compromised the shoes ability to properly function. , though I highly doubt you will get the same level of comfort from those selections as you would from the Salomon shoes. 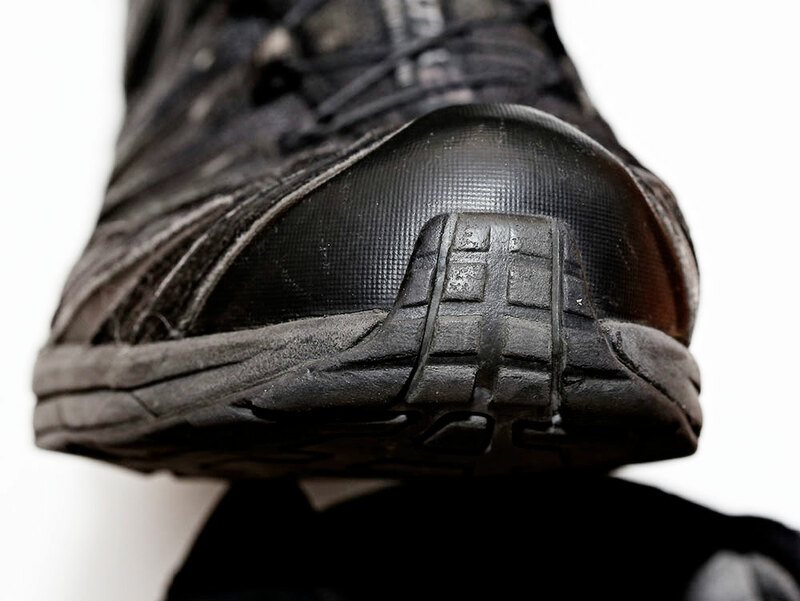 Next time you are looking for a good training shoe or a law enforcement / duty style or even a daily / EDC shoe that can take the rigors of serious use this shoe should be at the top of your list. shoe. 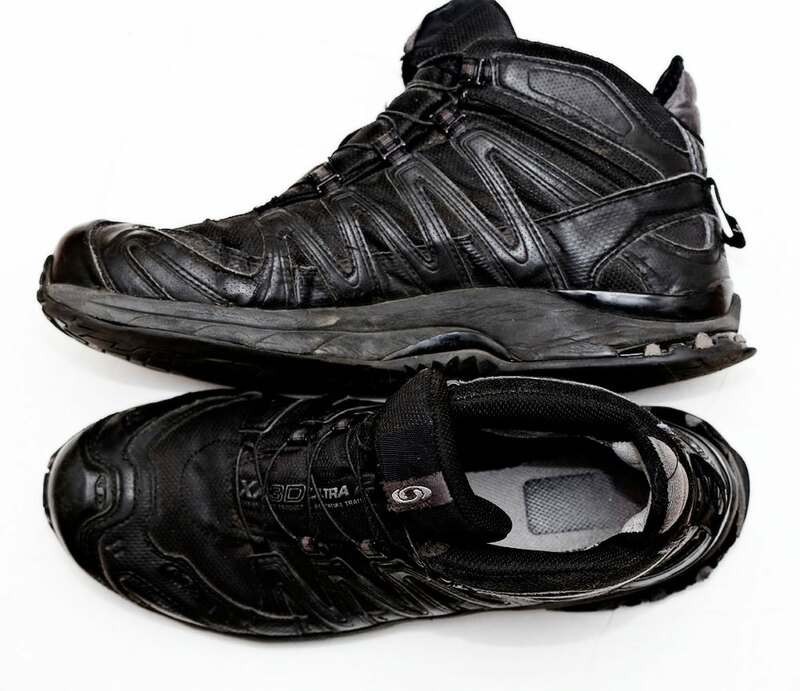 The Blackout photo'd below is the same shoe, ostensibly, but completely black. Great review, especially covering the longevity aspect. Good to see the quick lace system held up so well over time. I assume that is the original lace, correct? I bought a set in November last year, and have been wearing them somewhat regularly, and couldn't be happier. 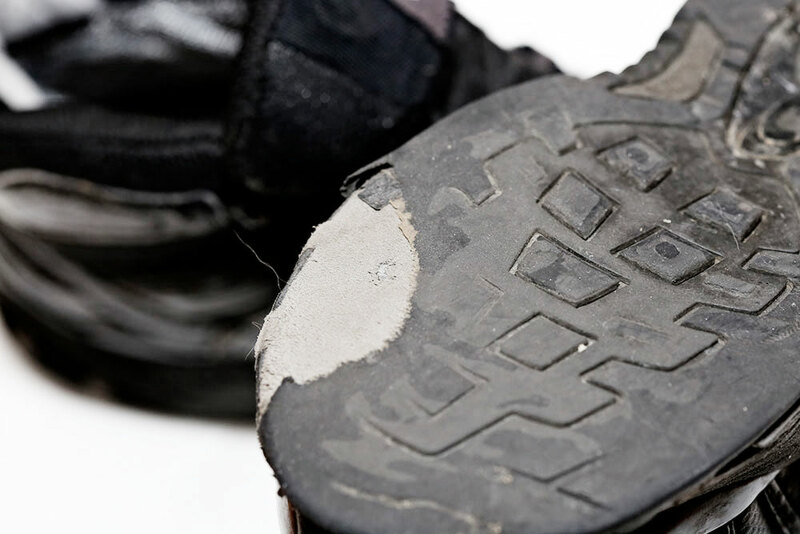 You are correct it is the original lace system, I have never broken, ripped or otherwise had any issues with this system on any salomon shoe. I have wide feet and it is always difficult to find shoes that are comfortable, especially when buying them over the internet. Fortunately, these fit the bill quite well from the first wearing when I put them on and breathed a sigh of relief. Nice to know Orthofeet a shoe company I can depend on for future purchases. Great review. The sock recommendations are much appreciated. Great review, thanks for the time you put into it. I have serious foot and leg issues, I broke myself and started getting old. Docs have me in rehab, I hike 4-5 days a week trying to fix myself. I needed a good pair of shoes/boots and op tactical was running a sale on the XA Forces mids so I picked up a pair. I have almost a year on them hiking on trails most of the year until the snow got knee deep. I agree, with sock choice, I wore them from hot and humid 90's to around 0 with - windchills. I also wore them training and for casual trips to my dirt and rock range. After a couple months they fit my feet like nothing ever has for the weight. 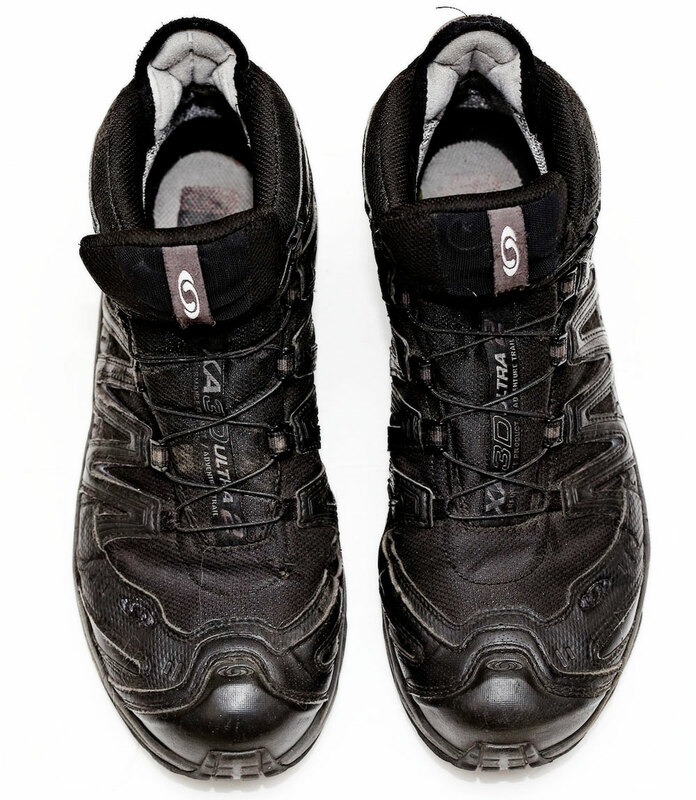 They are one of the most comfortable pair of hiking boots I've owned. I also started using them when I would be on my feet for long periods of time. After they loosened up they really molded to my odd shaped feet, slightly wide with low arches. They have a great amount of support as far as stability. There is some ankle support, not as much as a higher boot but for something so light on the feet I couldn't ask for any improvement. So far they are holding up, no problems yet. I wish I had them back when I did security patrol. Besides needing boots for work for 20 years I also spent a lot of cash on hiking boots as then I spent most of my free time in the woods. 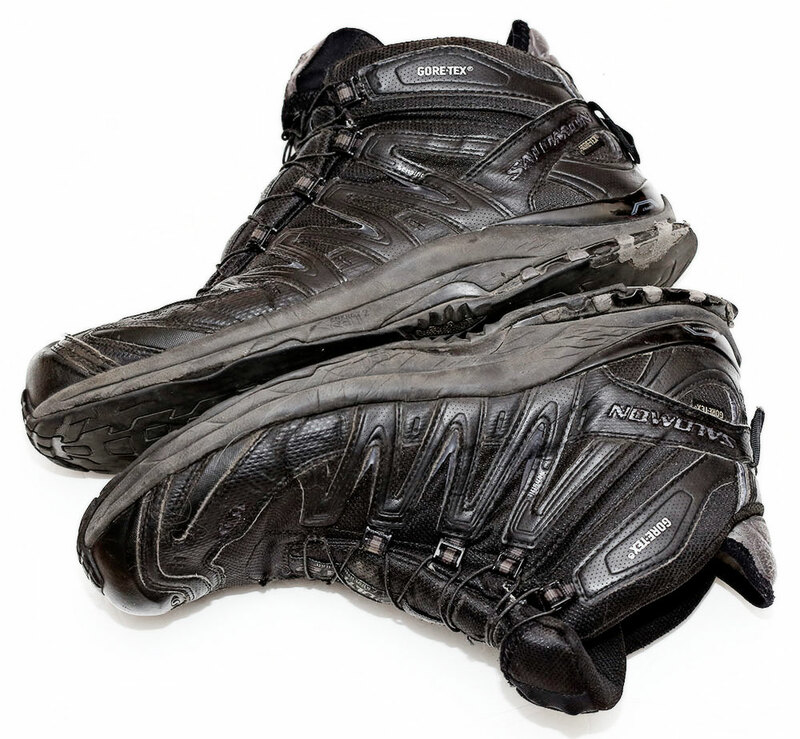 I am planning on getting another pair of the Salomons when the pair I have start wearing out.